Turmeric is the spice that everyone’s talking about. To get a bit of background, turmeric comes from the Curcuma family. It’s bright orange in colour, is mildly aromatic (with a slight gingery scent), and has a pungent earthy flavour. It’s been used in Asian cooking for thousands of years – it’s key to most Indian curries and gives it the distinct colour – but only recently have we in the West realized it’s superpower capabilities. Turmeric is an incredibly potent anti-inflammatory and antioxidant. Curcumin, the active ingredient in turmeric, is what gives it these medicinal properties. Curcumin helps with a number of health concerns such as arthritis, eczema, IBS, and other autoimmune diseases because it helps reduce inflammation in the body. It also aids digestion because it reduces bloating and gas. 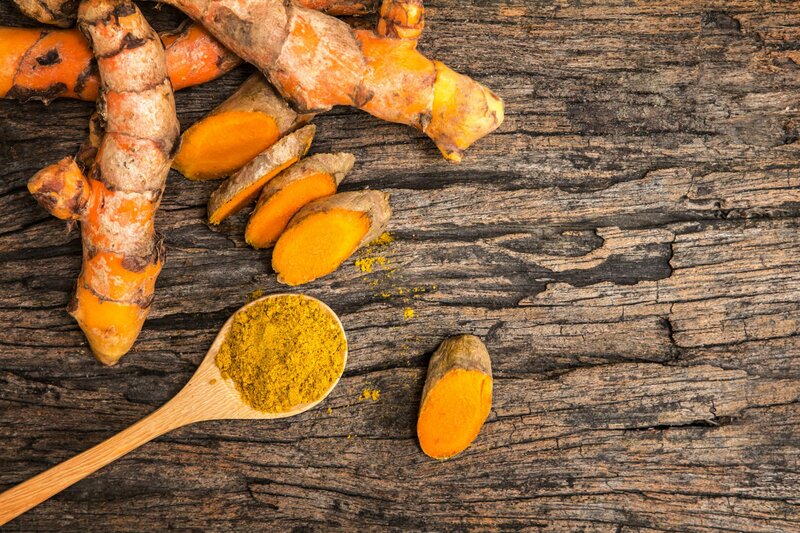 As well, many studies have shown that curcumin has anticancer effects, particularly that it can kill cancer cells and prevent more from growing. One 2007 study on mice showed that curcumin helped stop the spread of breast cancer cells to other parts of the body. It makes sense that turmeric is considered one of the world’s healthiest foods! *It’s important to note that the body cannot absorb curcumin well on its own. As a solution, make sure you consume it with pepper. Piperine, the active ingredient in pepper, enhances curcumin’s bioavailability by 2000%! To reap the best benefits of turmeric/curcumin, it must be consumed repeatedly over long periods of time. Many people actually take curcumin pills daily. If that’s not your thing though, just keep stockin’ up on curries, or our turmeric Golden Milk recipe below. Filled with cinnamon, cardamom and ginger, this flavourful, comforting beverage is perfect for a cold fall evening or a midday pick-me-up. The most efficient way to make turmeric golden milk is to first make a batch of golden milk paste that you can store in the fridge. When you do it this way, you can simply scoop a teaspoon into your milk of choice instead whipping up a batch of mixed spices each time. 1. Combine the pepper, ginger, cinnamon and salt in a small bowl. 2. Combine the turmeric and 1 and ½ cups of water in a small pot. When you’ve brought the mixture to a gentle simmer, add another ½ cup of water. Continue stirring. 3. Add your spice mix to the pot, and continue to cook, stirring often on low for 3 minutes, or until you have a thick and smooth paste. 4. Turn off heat and add coconut oil. 5. Add honey if desired as your mixture is cooling. Transfer your golden paste to a glass jar with a lid. This can be stored in the fridge for up to two weeks! 1. To make the milk, gently heat up one cup of milk (whichever kind you like, but it’s so good with coconut). You want your milk to be lukewarm, not hot. Whisk in 1 heaping teaspoon of the Golden Paste, and any honey or extra sweetener of your choice. Serve immediately and enjoy!